We can experience a fullness of life, achieving our potential and enjoying the fruits of living right. Flourishing has a ring. Humans have debated what it means to flourish for millenniums. Plato, Aristotle, Buddha and Jesus each provided thoughts on the ultimate fulfillment of human existence, achieving our potential. Yet thousands of years after the best human minds have guided, taught and yearned for flourishing, many still believe that something is amiss. Life feels wrong. We agonize over existence and seek magical cures. 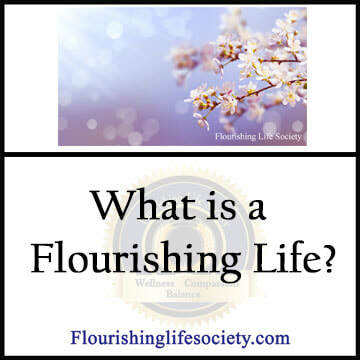 The purpose of Flourishing Life Society is to spread a more comprehensive understanding of human flourishing, a philosophy of more than positive emotions, but a life of goodness, flowing from both inside the mind and spreading through outward manifestations. Flourishing "means to live within an optimal range of human functioning, one that connotes goodness, generativity, growth, and resilience" (Fredrickson & Losada 2005). Like a branches on a lemon tree weighted with fruit, we can flourish, producing goodness. A goodness that is both felt in our hearts and flowing forth, blessing others and the world. This is the good life. This is a flourishing life. This is fulfilling our creative potential, adding more energy and goodness to an overly taxed world. Flourishing is a process, not a final destination. We flourish during our day to day living, not at some great destination. The idea of a process conflicts with the dreamy hopes of an eventual resting place, where we finally experience nirvana or paradise. The good news, however, is we can begin enjoying the fruits of flourishing immediately instead of waiting for some far off and vaguely understood concept. With the articles and tools, we can walk through this adventurous journey together, experiencing the many joys and successfully processing the sorrows. With each step, we find peace, knowing that the valleys and mountains we cross are our legacy, giving substance to our character and depth to our wisdom. Come, come with me and let's flourish together.